US police officers shot dead a 12-year-old black boy carrying a replica gun within seconds of their patrol car arriving on the scene, a surveillance video released Wednesday showed. The sudden end to the incident has stoked anger at police tactics in the United States, in the wake of rioting triggered by a decision not to prosecute a white officer who killed an unarmed black teenager. Tamir Rice died in hospital in the US city of Cleveland, Ohio on Sunday when two police officers, responding to a 911 emergency call, confronted him in a city park. 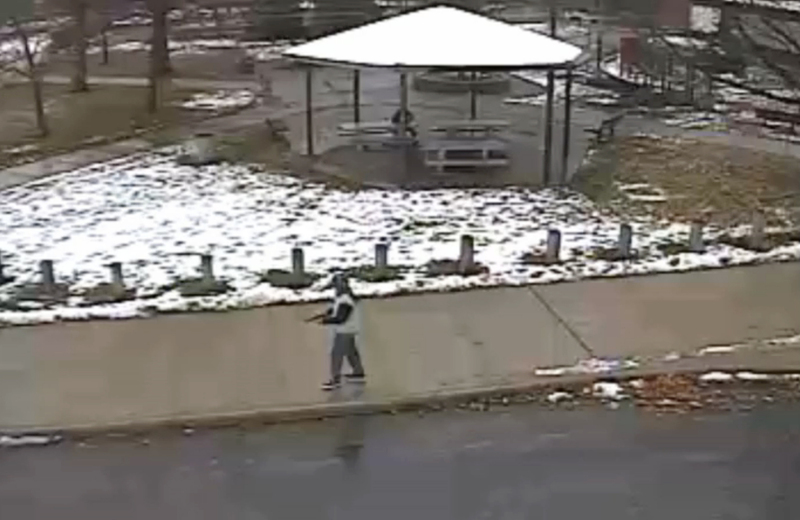 The footage shows Rice walking on a sidewalk playing with the toy, at one point aiming the replica weapon at a passerby, before sitting in a park gazebo. A patrol car pulls up and an officer emerges from passenger side of the vehicle with his gun drawn, immediately shooting Rice as he walks toward the car. Despite the short duration of the incident, Cleveland officials said Rice had ignored police orders to raise his arms and that the youngster had reached for his for his waist before he was shot. "Three commands were given to put up his hands," deputy police chief Edward Tomba told reporters. Cleveland police also released audio from a 911 call placed before officers arrived from a man saying a person that was probably a juvenile was holding a gun that he suspected was a toy. "There's a guy with a pistol," the caller said. "It's probably fake but he's pointing it at everybody." However, the dispatcher did not tell the officers that the gun was possibly a toy nor that the suspect was a youth, the tape showed. Cleveland police identified the officer who killed Rice as 26-year-old Timothy Loehman, who is white. Loehman, who joined the force in March, and the other officer driving the car in the video are on administrative leave while the shooting is being investigated. Both officers have been questioned, but their statements will not be released, according to Tomba. Tomba said the police video was released at the request of Rice's family, but that it was "not an effort to exonerate" the officers. "This is a tragic effort where a young member of community lost his life," he said. The incident sparked protests Tuesday in Cleveland, where about 200 peaceful demonstrators blocked major roads during rush hour. Cleveland's chief of police Calvin Williams defended the conduct of the officer who killed Rice, saying Monday "there is no time that a Cleveland police officer wants to go out and shoot a kid, period." The video was released in the wake of protests over another racially charged killing in the St Louis suburb of Ferguson, where a white officer shot dead a black unarmed teenager in August. That shooting, in a majority black community with an overwhelmingly white police force and city council, prompted a national debate about race and law enforcement. On Monday, a grand jury decided not to indict officer Darren Wilson over Michael Brown's killing, sparking two nights of riots in Ferguson and nationwide demonstrations in several US cities on Tuesday. Civil rights firebrand Al Sharpton said the Brown case renewed a fight for greater police accountability, and said protests would be staged nationwide on Saturday.